On a Digester at Riverside STW. 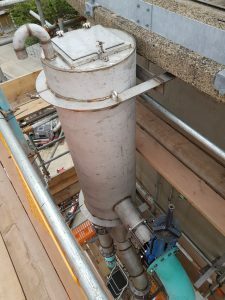 the existing limpet system was not fit for purpose and was not functioning due to excessive foaming from the process. Our brief was to change the arrangement to something that would eradicate the foaming effect, increase the efficiency of the process and negate the prohibitive costs of the anti-foaming agents that were having to be utilized. 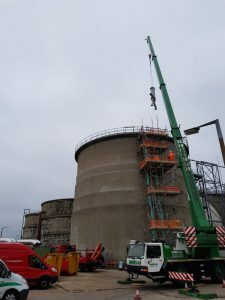 Our challenge was mainly logistical with the pipe being 19 metres in the air and the tanks situated next to a busy site road. 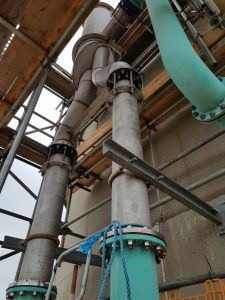 Other issues were the need to keep the digesters level identical by using complex pipe geometry. The window of opportunity was limited, due to the necessity of not interrupting the digestion process, therefore, time was of the essence. This was achieved with careful planning and everyone being aware of the goals and responsibilities.